Stormwater is rain water, melting snow, and melting ice. This water flows across parking lots, roadways, yards, driveways, roofs, and other surfaces. Some of this water will seep into the ground, flow into bodies of water, or evaporate. The water that could not seep into the ground, either due to flowing over a non-porous material (doesn't have small holes where the water can move through) or if the ground is saturated, is called stormwater runoff. When stormwater runoff enters the collector system, it is referred to as clear water. Clear water enters the collector system through many sources -- sump pumps, roof drains, foundation drains, driveway drains, window wells to name a few -- that are connected to the sewer lines. This is any connection that captures stormwater and is connected to the collector system; not the toilet, sink, shower/bath, or laundry connections. Clear water can cause many issues with the collection and treatment process. The collector system can carry a limited amount of water. Heavy rain events or melting snow in the spring can increase the amount of water entering the system through the illicit connections. Too much water entering the system at once can cause sewage back-ups into basements or overflows into the street. Once the clear water enters the treatment process, more issues arise. ​Clear water is acidic compared to sewage. A lot of clear water can "water down" the acidity of the wastewater. This creates a less-than-ideal environment for vital bacteria in the treatment process. In order to create the ideal environment, chemicals must be added so the bacteria do not die and are able to clean the wastewater. Clear water entering the treatment process increases the total gallons of wastewater being treated. At the end of the process, the water leaving the plant is disinfected. More water being treated means that there are more chemicals being used to disinfect the water leaving the plant. All these chemicals are costly, and treating clear water means that extra chemical is being wasted. Berwick Sewer District is a SEWER ONLY system. 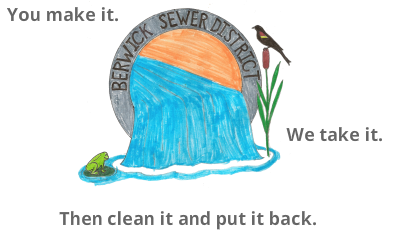 The Town of Berwick handles stormwater separately, which means that we have no need to treat clear water. Any excess water entering the treatment process increases the operation costs, which in turn increase the sewer user fees. How do you know if you have an illegal connection? Do you have a sump pump, foundation drain, or gutter drain? Yes, I have one (or more) of those. Is it connected to the sewer system? If you are unsure, contact us and we'll be glad to help. If it is not connected to the sewer system, there is no problem. Clear water is not entering the collector system through those connections. If it is connected to the sewer system, it is considered an illegal connection and needs to be disconnected. I have an illegal connection. What now? Depending on the connection simply disconnect the illegal connection, and if necessary put an extension on the drain so that the water goes away from the foundation. Rain barrels can also be used to collect rainwater coming off the roof, and this water can be used to water gardens. ​If you have enough yard space, a rain garden is a good alternative to capturing large amounts of water. The gardens are designed to capture water, and allow it to soak into the ground slowly. ​If none of these alternatives work for you, and the water must be removed from your property, the drains will have to be connected to the stormwater drains instead of the sewer system. In order to do this, contact the Town of Berwick for more information. If you have any questions or need assistance, contact us!